The share of agricultural products in Azerbaijan's non-oil exports accounts for more than 47 percent, the Minister of Economy of Azerbaijan Shahin Mustafayev said at the opening ceremony of the First China International Import Expo in Shanghai, China, the Azerbaijani Ministry of Economy said in a message Nov. 7. Chairman of the People's Republic of China Xi Jinping also attended the opening ceremony. The exhibition, which is held at the National Exhibition and Convention Center in Shanghai, brought together more than 3,000 companies from 170 countries. The first import exhibition in China features over 100 types of new products and technologies. More than 30 Azerbaijani companies operating in food production sector, present their products at the national pavilion. A number of forums are also held as part of the first China International Import Expo. 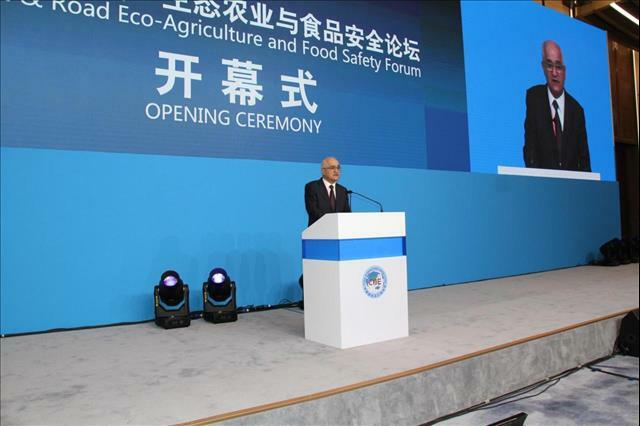 On November 6, the Azerbaijani delegation took part in a forum dedicated to ecological agriculture and food security, jointly organized by the Chinese Market Administration, the Chinese People's Association for Friendship with Foreign Countries and the Shanghai Municipality. Speaking at the forum, Shahin Mustafayev stressed that the Azerbaijani-Chinese relations are based on the principles of mutual respect and fraternity. Azerbaijan has not only become one of the first countries to support China's "One belt, One road" strategy, but also takes part in the implementation of this initiative, he said. "Using the potential of the Trans-Caspian International Transport Route as part of China's One Belt and One Road initiative opens up broad opportunities for cooperation in the economic sector, in particular in investment, trade and transit. Azerbaijan is interested in cooperation with China not only in the transport and transit sector, but also in agriculture and food security," Mustafayev said. Chinese companies are already successfully cooperating with Azerbaijan in the development of cotton production and the material-technical base of sericulture. The minister added that Azerbaijan pays great attention to the development of agriculture. As a result of the measures taken, the production of agricultural products over the past 15 years has increased by 1.7 times, and in the first nine months of 2018 - by 4.3 percent. He also noted that the share of agricultural products in Azerbaijan's non-oil exports accounted for more than 47 percent. The minister also said that in the Doing Business 2019 report of the World Bank, Azerbaijan entered the list of 10 reformer countries and was declared the country that had the most reforms. In the new report, Azerbaijan climbed 32 steps and ranked 25th among 190 countries, and also became a leader among the CIS countries. Members of the Azerbaijani delegation, namely the Deputy Minister of Agriculture Seyfaddin Talibov, the Acting President of Azerbaijan Investment and Export Promotion Foundation (AZPROMO) Yusif Abdullayev and the Deputy chairman of the Food Security Agency Rufat Rustamzade also participated in the Trade and Investments forum.